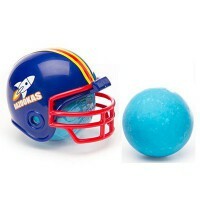 Fans of US culture and American football will love these fabulous jawbreakers! Each 1.5 inch (just under 4 cm) jawbreaker candy comes with an adorable football helmet. Perfect for party favors and gifts, Kidsmania jawbreakers are also long-lasting and delicious! Dextrose, sugar, chewing gum base, glucose syrup, maltodextrin, artificial flavors, acidity regulator E330, glycerin, corn starch, soy lecithin E322, thickening agent E414, glazing agent E903, sweetener E951, colors E129*-E133-E102*, antioxidant E321, May contain traces of gluten, soy, peanuts, tree nuts and seeds. Contains a source of phenylalanine. *May have an adverse effect on activity and attention in children. Not recommended for children under 3 years. Contains GMO. Nutrition facts (for 100g): calories 341Kcal, total fat 0.1g (saturated fat 0g), total carbohydrate 84.7g (sugar 84.7g), protein 0g, salt 0g. J'ai commandée en pensant avoir une boule bleu mais en recevant le colis j'ai eu une boule Orange et elle n'est pas vraiment bonne.. Déçue ! Sinon elle en vaut vraiment le prix.